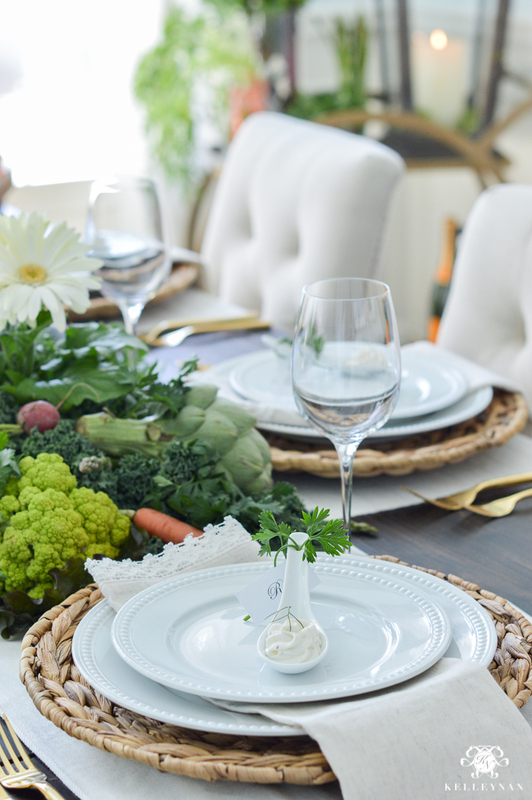 Welcome to this season’s Styled + Set Holiday Entertaining blog tour hosted by Lory of Designthusiasm. Today is all about Easter and if you’re joining from Design, Dining and Diapers, I’m so glad you stopped by! 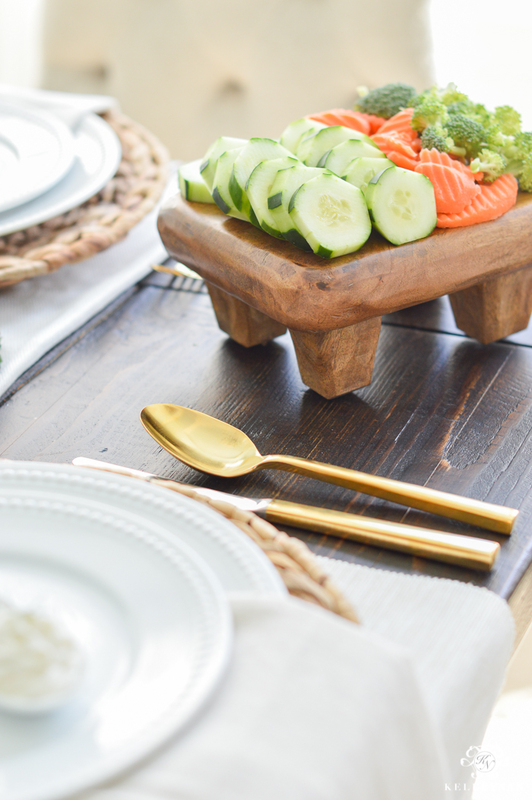 If you’re a regular visitor, welcome back – can you believe it’s been two months since I last shared a tablescape and over three since I’ve hosted in my dining room? We are long overdue, friends 😉 At the bottom of the post, you can find links to check out the other bloggers, all ready for Easter. I’ll also include affiliate links and sources at the end. I have been thinking of my Easter tablescape since October. Pretty ridiculous, right? 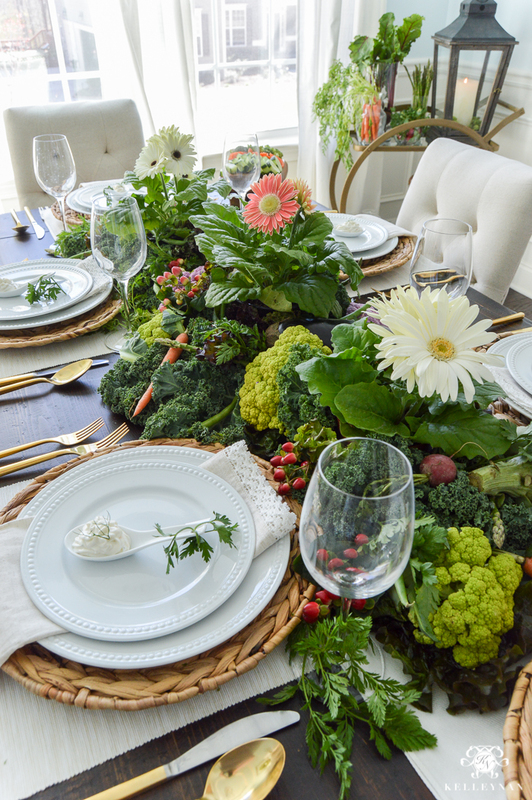 When I created this Thanksgiving table for Pottery Barn, the overall concept was based on a deconstructed cornucopia. It was then I considered a similar approach, minus the squash and adding spring produce. 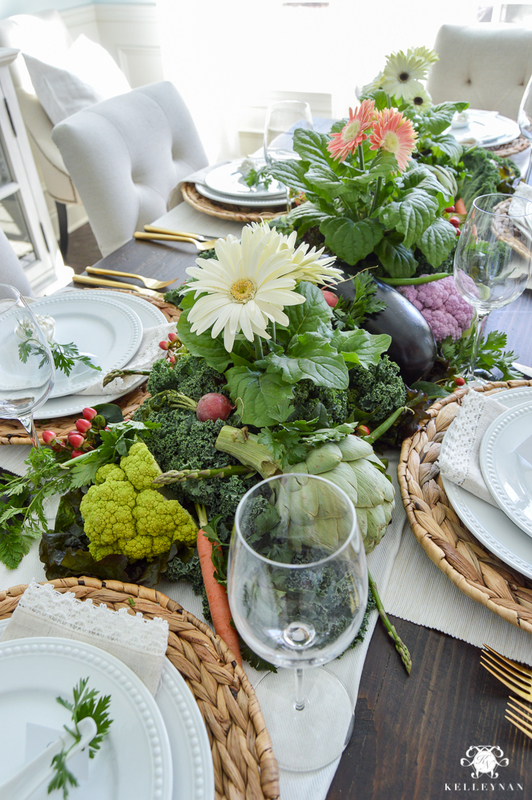 With lettuces, carrots, and colorful cauliflower, the idea for a vegetable patch Easter table was born. First, I laid two runners horizontally. THESE are my go-to’s for almost every table. They are so versatile and are short enough to run sideways instead of vertically. Next, I stretched a similarly colored pashmina down the center of the table to serve as a base for my produce spread. I used bunches of Kale leaves as my foundation before mixing in leaves of hearty lettuce. I positioned three small potted gerbera daisies down the table and built a bit of foundation up from those. 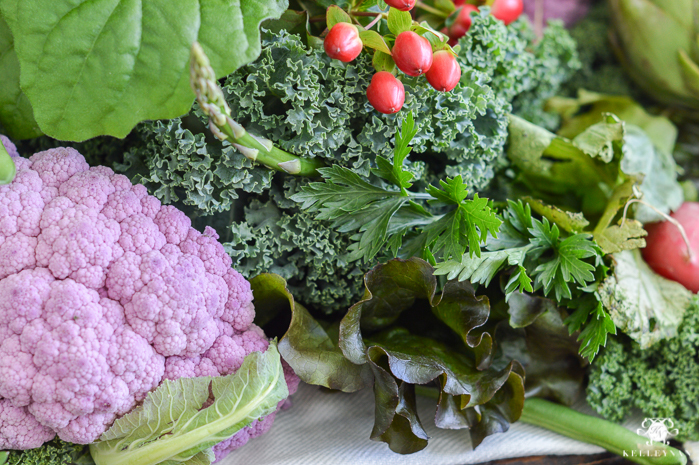 Here’s a little game- how many different veggies can you spy? 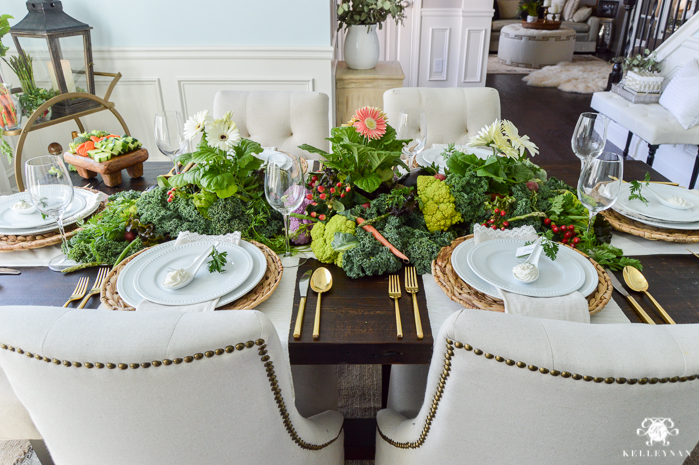 I kept the place settings more stark to give that contrast and let the veggie centerpiece make the statement. The water hyacinth chargers (SIMILAR) reminded me of easter baskets 😉 One 0f my absolute favorite (and easy) details of the table are the individual tasting spoons at each seat. 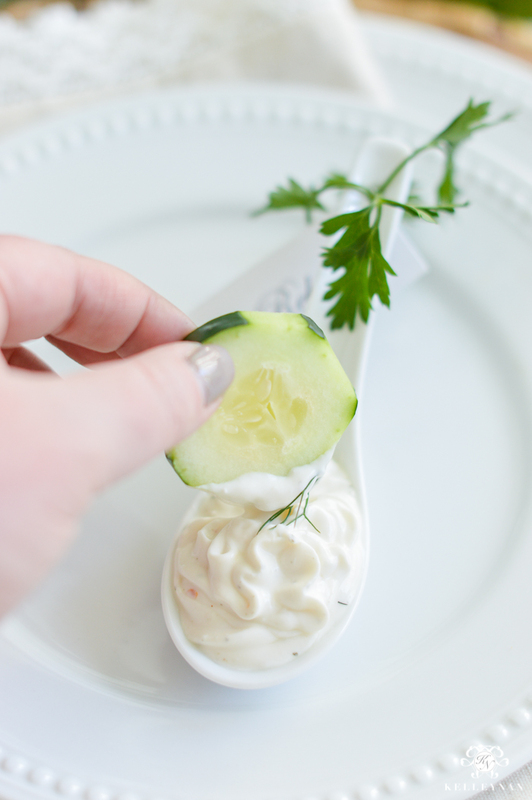 I piped a thick vegetable dip (sour cream based – not dressing) into tasting spoons for individual dip portions for passed crudités. I didn’t have any thin ribbon or twine on hand so I used a little parsley, loosely knotted, to secure each place card. I finished each with the tiniest sprig of dill. When I shared the rabbit food garden patch idea with my mom (my regular planning partner), she was disappointed I hadn’t incorporated friends from Beatrix Potter and called the centerpiece “Mr. McGregor’s Garden”. Well, that would have been inventive. You win, mom. Next time! While this board, loaded with crudités, is the mini version, I have two in the medium size. I use them for entertaining, as permanent decorative fixtures in my kitchen, and as passable trays. One of the most perfect pieces I’ve ever purchased. Here’s a glimpse of the different sizes available. 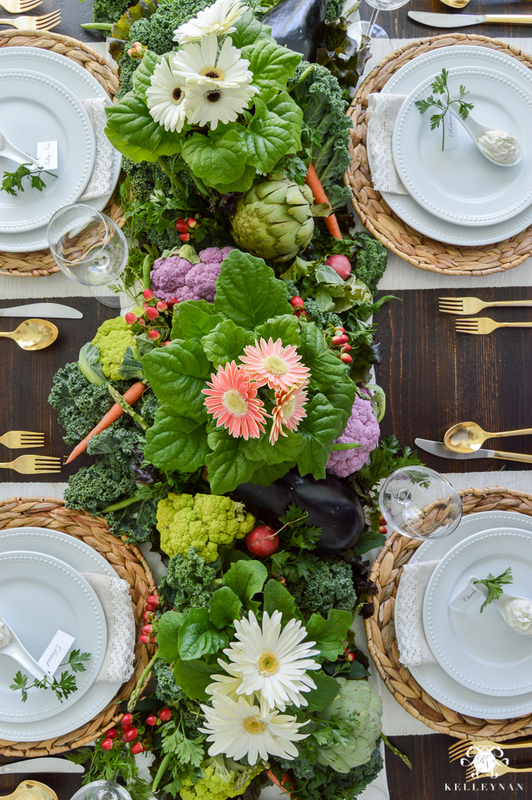 The awesome thing about creating a produce-based table is that you don’t have to be a floral designer to pull it off and make a statement. It’s more like decorating a Christmas tree – you just keep adding the ornaments in spaces where it makes sense. This can be done pretty quickly – after church or before guests arrive – but this is not a centerpiece I would set up a day in advance. In the beginning of the post, I mentioned I went a little overboard in guessing how much produce I needed to create a “proud” vegetable garden down the table’s center. Well, I overshot. By a lot. 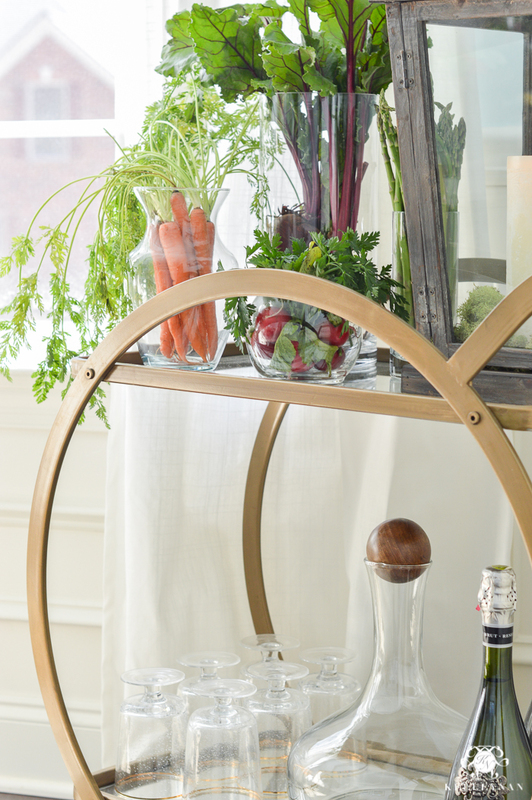 I used clear glass vases to create veggie arrangements on my bar cart. I loved the beets but they proved more difficult to incorporate into the table with their long, leafy stems, using the approach I did. If your garden hedge starts looking more like a wall (let’s be honest, mine is certainly on the verge), consider displaying the remaining produce nearby. 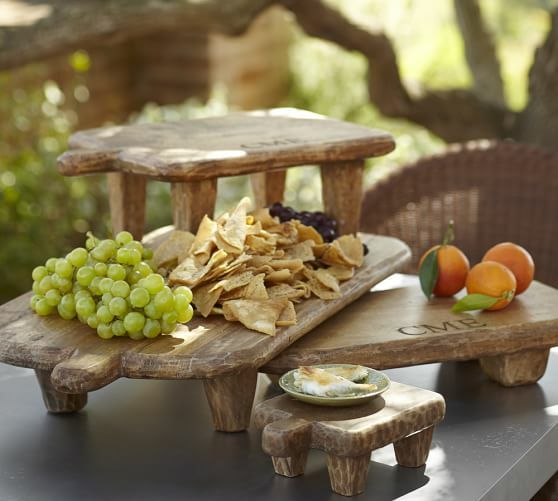 Next, head to Wood Grain Cottage for more Easter entertaining inspiration! I’m so jealous of her bits of outdoor she has already been able to incorporate. 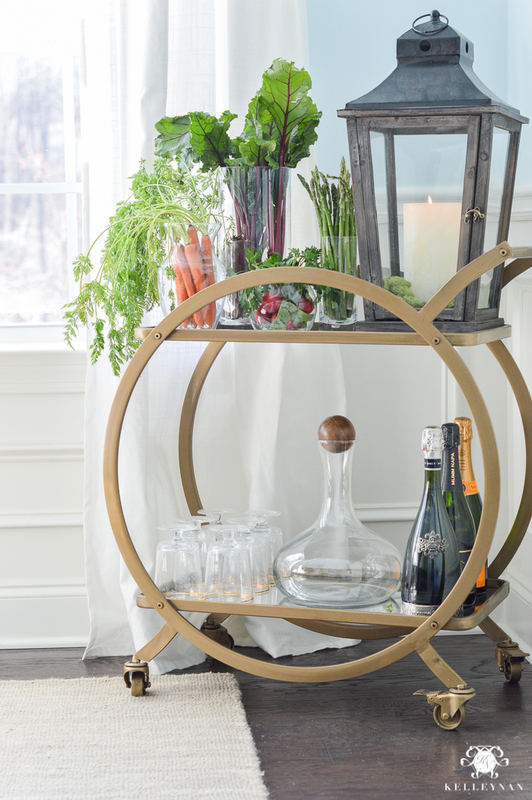 You won’t want to miss any of the bloggers sharing entertaining ideas this week. See what’s been shared below. Kel, this is the cutest idea ever!! It looks so gorgeous in your dining room with all this rich vibrant color against your pale blue walls!! I’m immediately transported!! LOVE it! Tam, thank you!! I can’t wait to see what you do next! Love, love, love this Kelley Nan! So, so creative and so fun! 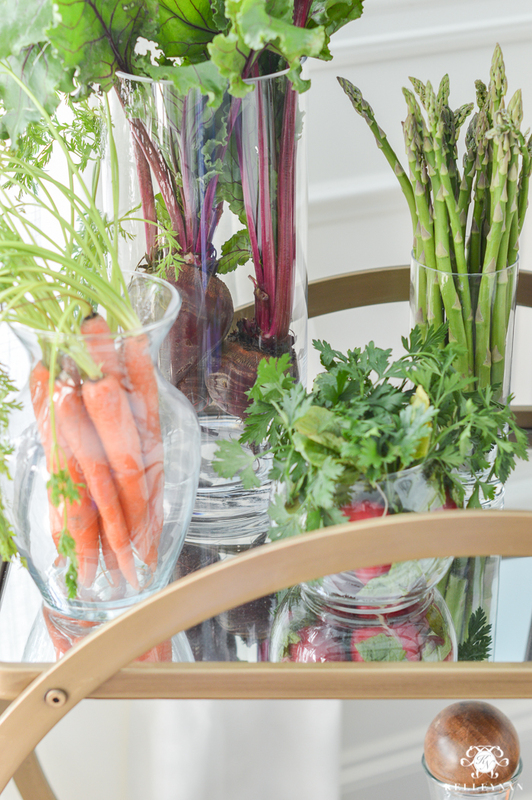 What a great way to welcome in Spring time and a reminder to ‘eat your vegetables’! Bree, thank you, sweet friend! Happy Easter! Kimberly, this is one of the sweetest compliments I’ve ever received; thank you! So inventive and fun! Love ! 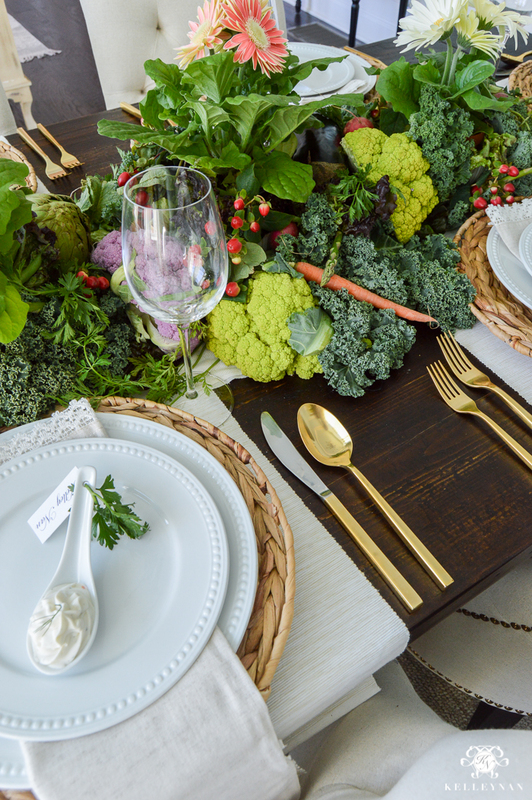 Such a fabulous table setting! I love all the fresh veggies! So fun! Shayna, thank you so much!! I loved your table! I love it!! 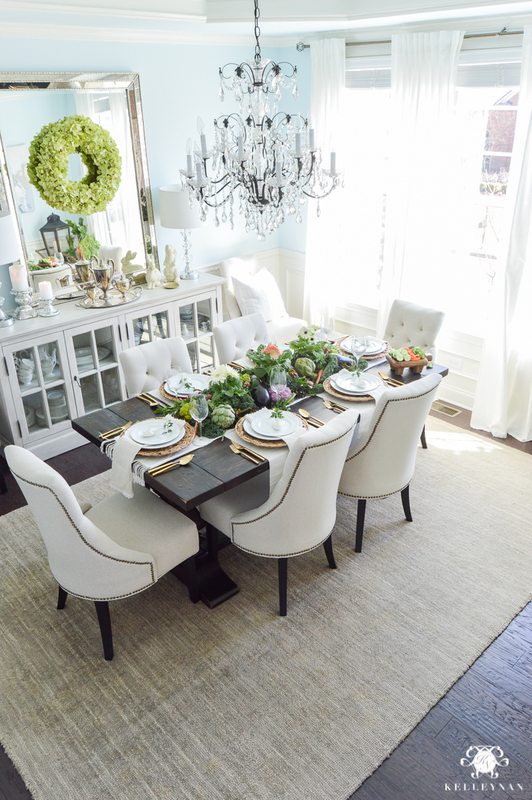 It is so lush and fresh, perfect for an Easter brunch. Jen, thank you! Your napkins were adorable! Kelley Nan this is maybe the cutest darn thing I have ever seen! It’s so clever and fun…yet easy too. You definitely hit this one out of the park. 🙂 Wishing you and your family a very Happy Easter! Oh, Ann, thank you so much! I went a little nuts and lost my mind a bit with those veggies! haha- Wishing you a wonderful and happy Easter! 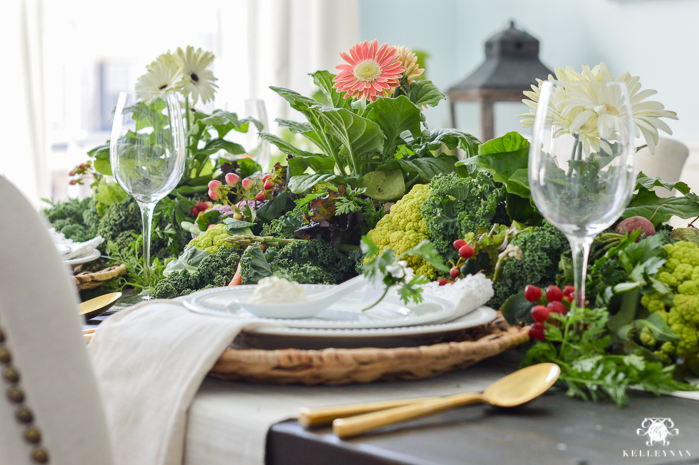 I just happened upon this post and I’m blown away by the beauty of this vegetable table centerpiece. Wow! Meghan, it means so much for you to take the time to stop by and to leave a comment. Thank you so so much! I didn’t see a reference to this, though perhaps I missed it? On my screen the cauliflower has awesome pink/ purple, and lime green colors! Though maybe the green is natural … did you possibly dye them, or are my eyes or my iPad failing me?!? Again, this is a beautiful presentation, and I’m “filing” it away for the future! Thanks for sharing! what an amazingly fun idea!! The outcome is over the top beautiful! I love it when I wake up and see in my emails that you’ve posted something new!! Marion, that makes me smile so hard. Thank YOU so very much! That is beautiful! You did a great job. Also I agree with your sweet mom, rabbits would be cute mixed in there! Wow, wow and wow! So much creativity, color and beauty on this table. Well done! Ingrid, thank you so much! It was so fun to do! Kelley, I just LOVE this table! First, let me say, you’re the only person besides me I’ve ever seen use a pashmina on the table! People thought I was nuts, but it works… 🙂 Your veggie runner is perfect!! I, too, love to decorate with food but I’ve never done quite the job you did here. 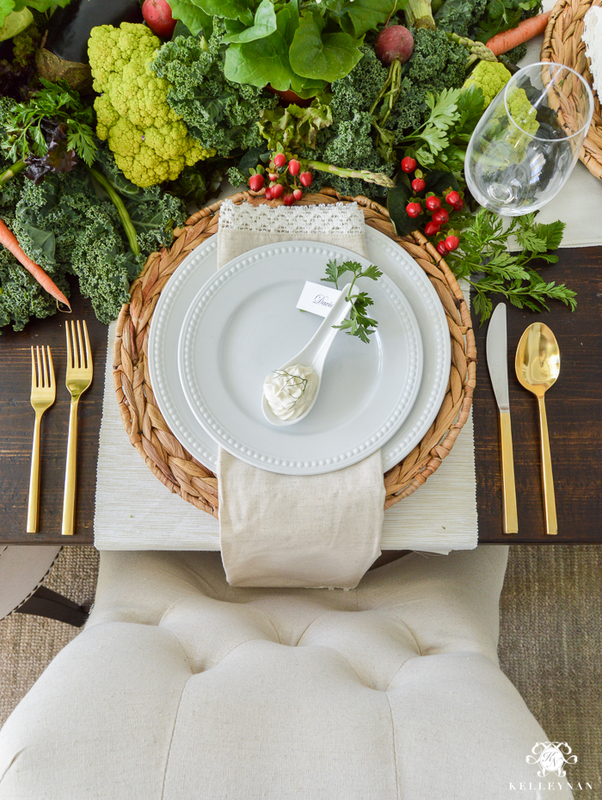 I love the way the rest of your table is elegant yet understated, letting the centerpiece do the talking. It’s perfectly wonderful!! Lory, yes!! Haha- I always hit the scarves if I’m going crazy on the centerpiece. Thank you so much for hosting another fab tour! Mysha thank you so much; happy Easter! Again, you have outdone yourself!! This is such a clever and fresh idea! You have brought the beauties of the outdoor inside. 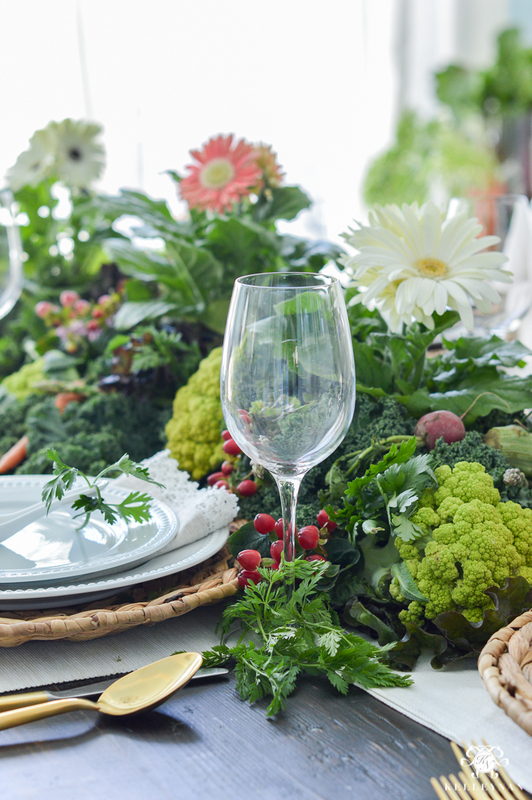 Your table is inviting and elegant with the blessing of Mother Nature! Thanks again for sharing your creativity! So colorful! Love this idea.